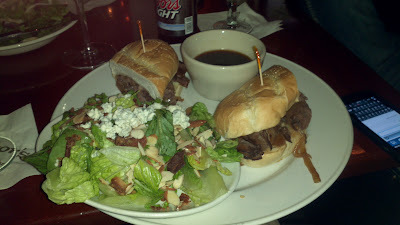 French Dip Reviews: 4 of 5 DeliciScore™ (Great) Awarded to Hector's Restaurant for their Prime Rib Dip Sandwich in Kirkland, WA on this 16th day of November, 2011 - Not too bad, Hector. 4 of 5 DeliciScore™ (Great) Awarded to Hector's Restaurant for their Prime Rib Dip Sandwich in Kirkland, WA on this 16th day of November, 2011 - Not too bad, Hector. The scene from our table. Hector's is a pretty good little bar and place to eat in downtown Kirkland. I've been there quite a few times and not sure that I had experienced their French dip before. My buddy Matt had been there within the last few months and had let me know about their dip. 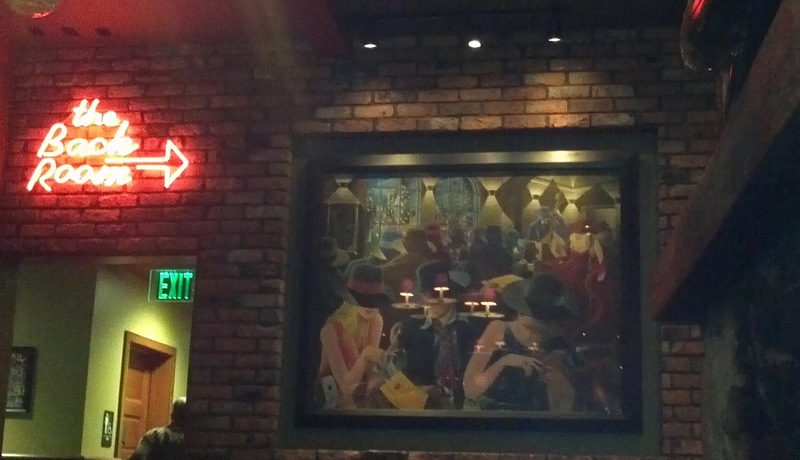 I like the ambiance in there overall: TVs, low light, cool tables and chairs, a nice bar. I believe they recently lost their cook, however, to Redmond's Bar & Grill, who also has a dip that is on my list. I was out with my buddy Leigh for a business conversation at dinnertime and decided I needed to go with the dip. I was a bit distracted in conversation and drinks so didn't take copious notes on this dip but did demonstrate to Leigh and Jessica the review method: prepare, observe and smell, taste alone, taste with au jus, enjoy, review. Prime Rib dip. 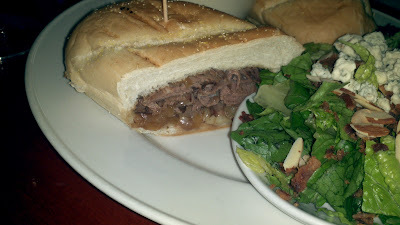 Caramelized onions, pepper jack cheese on a French roll with au jus. $14. I didn't get the fries. Here it is. I got a salad with Bleu Cheese on the side. They added bleu cheese but forgot dressing!!?? The dip looked pretty good overall. The bread looked so-so, kinda plain. The au jus wasn't all that filled up; I think I'd like it 'teaming'. You can see the caramelized onions hanging off the side; I think they were red onions. Salad, 2, not that good, lettuce wasn't all that good. They forgot the dressing at first. Bread, 3, basic bread, nothing special at all here. Au jus, 3, was fine, wasn't overly hot. Had enough, though for bread that was reasonably absorbent. Bread absorbency, 2, soaked up more au jus than I wanted. Sloppy and wet sandwich is good but not exactly the goal. Meat, 3, good enough Prime Rib but nothing that special, fresh-looking or fancy. Cheese, 3, didn't really notice that it was Pepperjack or spicy. Non-meat toppings (caramelized onions), 4, these were good and tasty onions and really added something to the sandwich; they made the sandwich taste good alone. Value, 3, for $14 this was okay but not great value. They make it "fancy" with the caramelized onions and pepperjack cheese. Overall, a generous 4. This is a good sandwich overall but not the best dip. Eating it without the au jus was good. It tastes good alone. The au jus wasn't overly hot but good enough and added something but not a ton. The salad's look detracted from the sandwich; they might want to consider plating the salad separately. The bread was fine but nothing really fancy in any way so kind of detracted. I recommend that they put more au jus in the cup to show their confidence in their juice. Here's a closer up pic of the sandwich. You can see it's simple and tasty. The cheese wasn't obvious but the onions were quite good. The bread was wide but very simple.